Home Blog VMware lays out roadmap to the clouds. VMware lays out roadmap to the clouds. Earlier this year, Diane Greene, VMware President and Co-Founder, described cloud computing as the final evolutionary step for virtualization. Reza Malekzadeh, Senior Director of Products and Marketing reinforced that view at the Nordic Virtualization Conference in June 2. 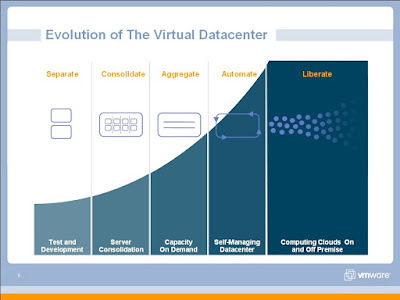 They both presented a five stage vision where virtualization is used first for test and development, then for server consolidation, then for infrastructure on demand, then for data center automation and finally for cloud computing. Is this their mantra now?